Google Sheets Developer & Data Analytics Instructor. Let me help you with Google Sheets, Apps Script and Data Studio. It’s easy in Excel. So it should be easy in Tableau right? Well, not quite. I have 200 unique regions in my dataset so I wanted the chart to show a range from the min to the max. Then I wanted to overlay an average line and a specific, selected region. I looked everywhere but couldn’t find a tutorial detailing how to do this. This excellent post came close, but it doesn’t allow multiple lines since you can’t have multiple instances of multiple measure values. Then I read this forum post and almost dropped the idea, thinking it was impossible. But a search through the Tableau Zen Masters public galleries led to me to this particular chart from Joe Mako, exactly what I was looking for! I downloaded it, played around with it and then implemented my own version. The clever part is that it uses a polygon to create the banding. 1. Setup your data in Excel first. 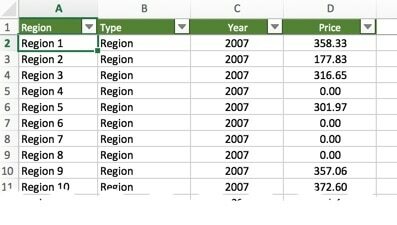 My dataset consisted of a list of regions, each with a price listed per year, ranging from 2007 to 2015. The data was stacked in a tall table format. The second column, Type, was added so that I can classify “Regions” and “Bands” separately. 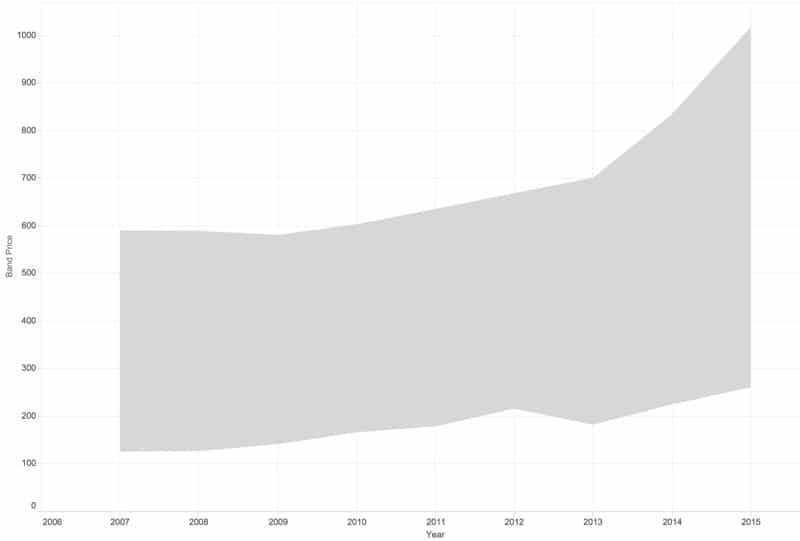 where the range D2:D201 contains all the prices for 2007 in my dataset. It’ll need adjusting for the other years, 2008, 2009 etc. Quick aside: In his worksheet, Joe Mako used UNIONs to place all of his data into one table, stacked on top of each other. 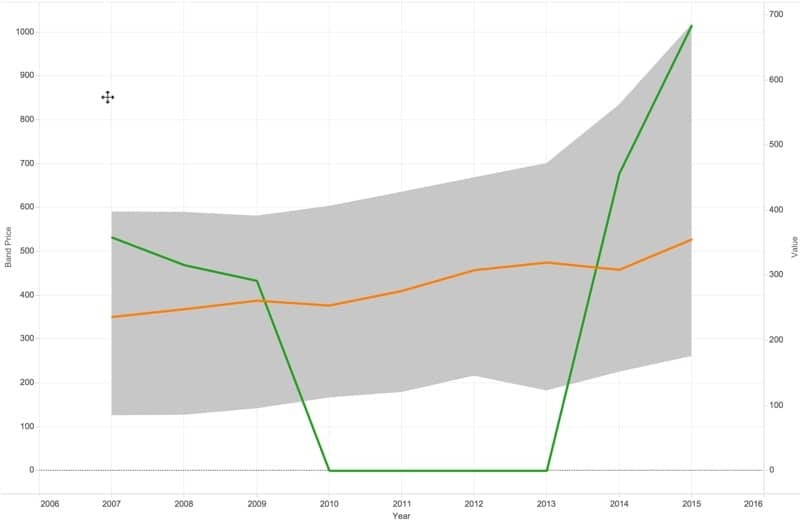 This feature was introduced in Tableau 9.3. Since I’m still on 9.2 (yes, I know, weekend project to update!) and since I want to focus on Tableau here, not SQL, we’ll do this step manually in Excel. Look out for a future post on this. 2. Open Tableau and connect to this Excel file. Select the tab with your data and open a new sheet. This creates a new measure (column) where all the Region rows are NULL but all of the Band Rows (min and max) have the price recorded. This does the opposite – it creates a new measure where all the Region rows have their price recorded but all of the Band rows are NULL. 4. Drag Year onto the Rows shelf and Band Price onto the column shelf. Tableau will aggregate Band Price using SUM, which is fine. 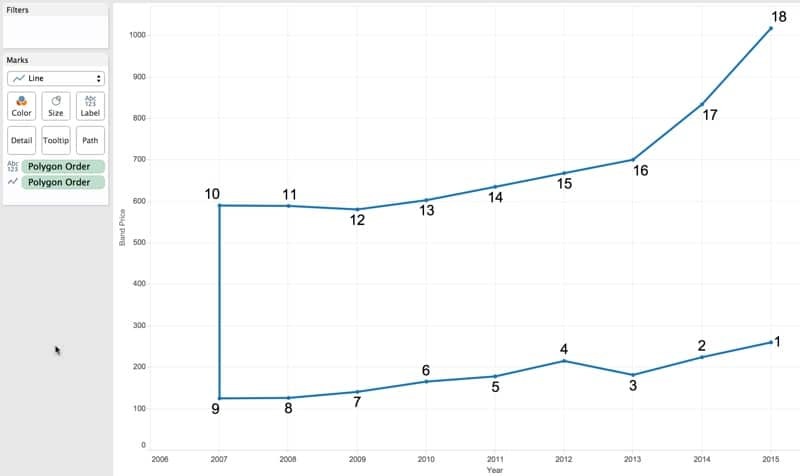 This gives us a simple line chart, no surprises there. At the moment, the line represents the sum of the Band Min and Band Max values (e.g. the 2007 value of the line is 716 which is 126 (min) + 590 (max)). 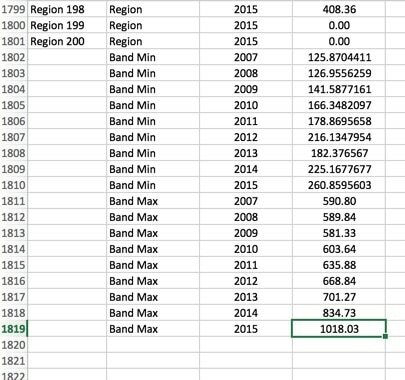 What this does is create a new measure where the Band Min rows are labelled with negative year numbers, but the Band Max rows are labelled with a positive year number. Now drag this measure onto the Marks shelf and change to a dimension and you’ll see the points for each year be separated out into min and max, as we want. Then select Path from the dropdown menu next to the Polygon Order on the Marks Shelf. Boom! You’re essentially done. There’s some tidying left to do and setting up the dashboard with the Region filter but that’s it. 11. Tidy up the sheet by hiding the second axis. 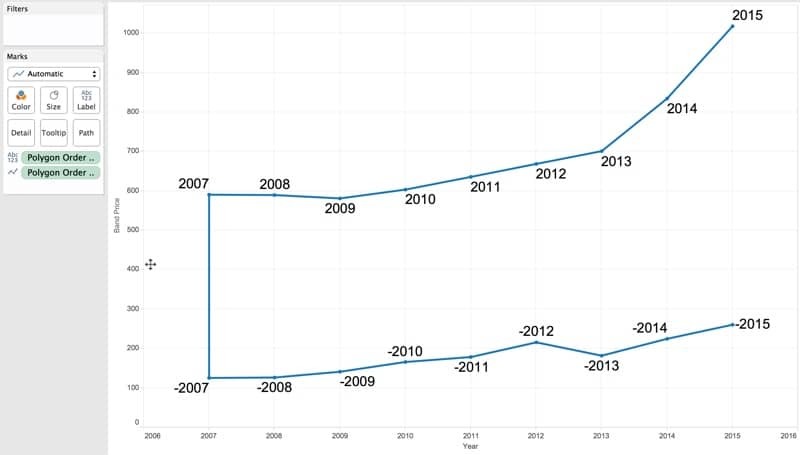 Adjust the Year axis to run from 2007 to 2015 so that our bands run to the edges of our chart. Rename the other axes, add titles, change colors if you want. 12. Create a new dashboard and add the “Multi-line with bands” sheet. 13. 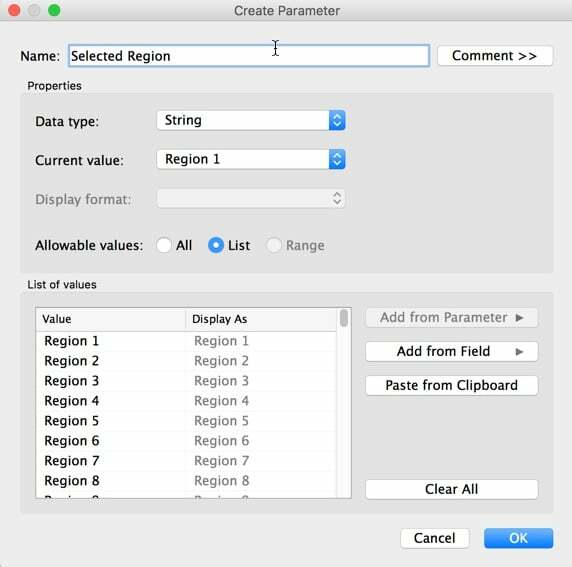 Click the top right arrow of this sheet and add a quick filter for the calculated parameter “Selected Region”. This will give you the desired multi-line, dynamic chart with bands. Click here to see the live version on Tableau. Any questions, leave a comment or send me an email. Thanks! 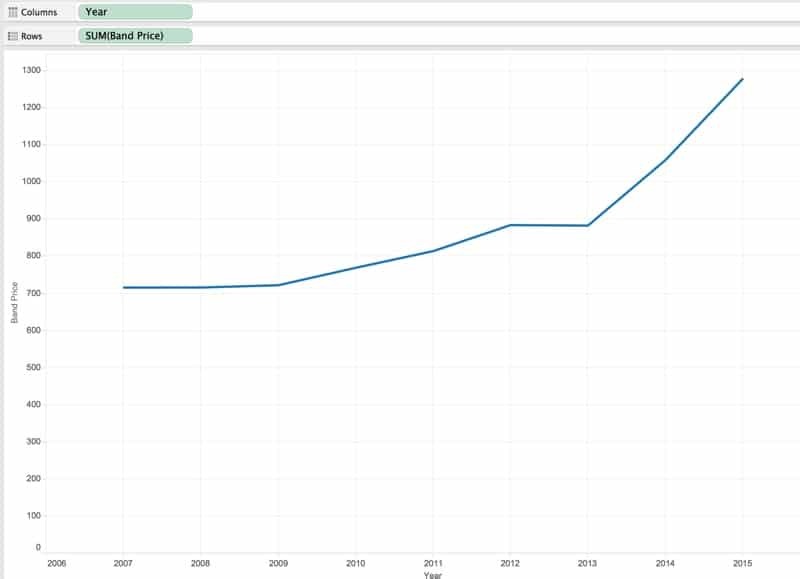 I have followed the instructions for the multi-range chart with custom range banding in Tableau. I had to change the second IIF statement slightly but apart from that it works. I cannot get the synchronise axis to work as it is greyed out. Have you any idea why this could be? I am using tableau 10.3.